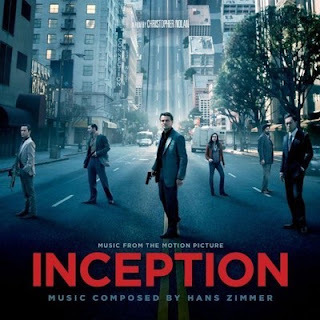 For today's randomness post, we take a look at Hans Zimmer's score from the movie "Inception." For those of you new to Think Muzik, let me take a moment to state the simple rules for randomness posts. I go through my iTunes library with my eyes closed and randomly select something, and then blog about it. Last week, we looked at Daft Punk's soundtrack for "Tron: Legacy." As I stated last week, I love film music. There is (arguably) no one on Earth better at it than Hans Zimmer. This man composes stunningly beautiful music, and his credit list is indeed extensive. I need to take a moment to talk about the movie itself. This was a remarkable movie, and not just because Leonardo DiCaprio has suddenly transformed from Hunkzilla into good--if not great actor. Many memorable and emotional moments arise from the movie and the film manages an impressive level of suspense throughout. DiCaprio's character is desperate to see his children again after years of absence, and the only way that will be possible is if he can successfully plant an idea in a businessman's mind. The plot is very complex, yet still easy to follow. Now, back to the music. The music combines peaceful, droning ambiance with melodious electronic elements interwoven with beautiful symphony, and even some subtle choral elements. Check out a couple of tracks from the score below. Thanks for reading and enjoy! !